While many proverbs speak to us directly, we can gain much greater insight by studying the book of Proverbs as a whole, understanding its relationship to ancient non-Israelite wisdom and listening to its conversation with the other great voices of wisdom in Scripture - Job and Ecclesiastes. This is a welcome guide to reading and studying, understanding and savouring the Proverbs for all their wisdom. 174 pages, from IVP. About "How to Read Proverbs"
Through this welcome guide to reading and studying, Tremper Longman III takes you down the path of Proverbs into an understanding of how Christ is the climax and embodiment of wisdom. Better is a dry morsel with quiet than a house full of feasting with strife.A perverse person spreads strife, and a whisperer separates close friends.Go to the ant, you lazybones; consider its ways, and be wise.Everyday we make choices on the path of life. Proverbs are memorable capsules of wisdom, chiseled in words and polished through use by those who have traveled that path ahead of us. But the proverbs of the Bible make a greater claim than "a penny saved is a penny earned." They are woven into the web of divine revelation, rooted in the "fear of the Lord" that is the beginning of wisdom.While many proverbs speak to us directly, we can gain much greater insight by studying the book of Proverbs as a whole, understanding its relationship to ancient non-Israelite wisdom and listening to its conversation with the other great voices of wisdom in Scripture--Job and Ecclesiastes.InHow to Read ProverbsTremper Longman III provides a welcome guide to reading and studying, understanding and savoring the Proverbs for all their wisdom. Most important for Christian readers, we gain insight into how Christ is the climax and embodiment of wisdom. 3. Woman Wisdom Or Folly--which Will It Be? 4. What Exactly Is A Proverb--and How Does It Work? 5. Are Proverbs Always True? 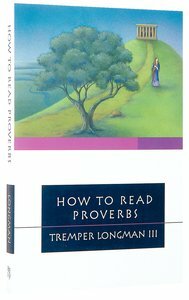 Customer Reviews For "How to Read Proverbs"
Longman has provided a great tool for understanding Proverbs. Though a scholar, he has written in a non-academic way to open up Proverbs. His chapters are concise, with the most complex being Chapter 6, where he looks at ancient near-eastern parallels to the biblical book of Proverbs. Even here perseverance in reading the material will be rewarded. He provides questions for reflection at the end of each chapter, with further reading for those who wish to explore in a deeper way the material that he has covered in the chapter. For anyone wishing to grapple with and to understand the book of Proverbs, this should be the first point of call.